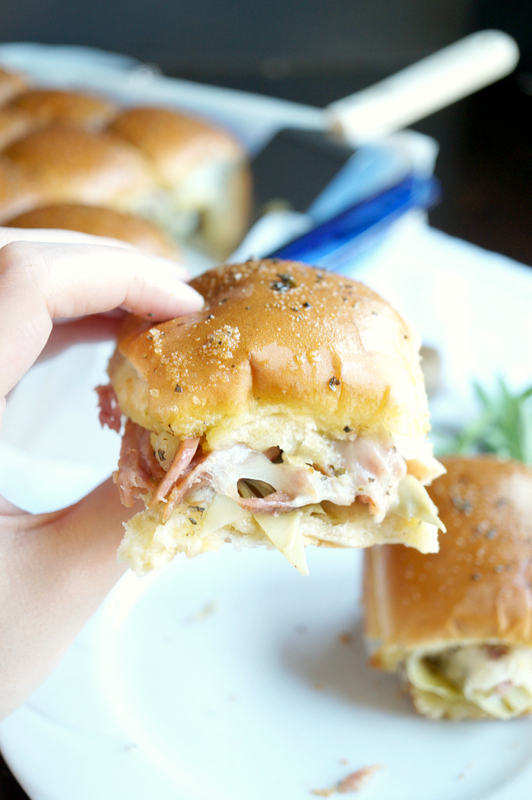 If you have a fridge full of leftover Easter ham, whip up these Panini-Style Ham and Cheese Sliders! They’re stuffed with thick sliced ham, provolone, marinated artichokes, and an olive oil & herb topping. Helloooo, friends! So I know it’s already Thursday, but… anyone else still dealing with leftover Easter ham? Because if you are, seriously, ZERO shame. Those hams are just huge and there’s no way you can get through a whole hock unless you have your entire extended family over. We don’t usually do a ham roast but we did this year, which means we’ve been having a fridge full of leftovers. In case you just can’t stomach another plate of reheated ham with mashed potatoes and green beans, make these sliders! 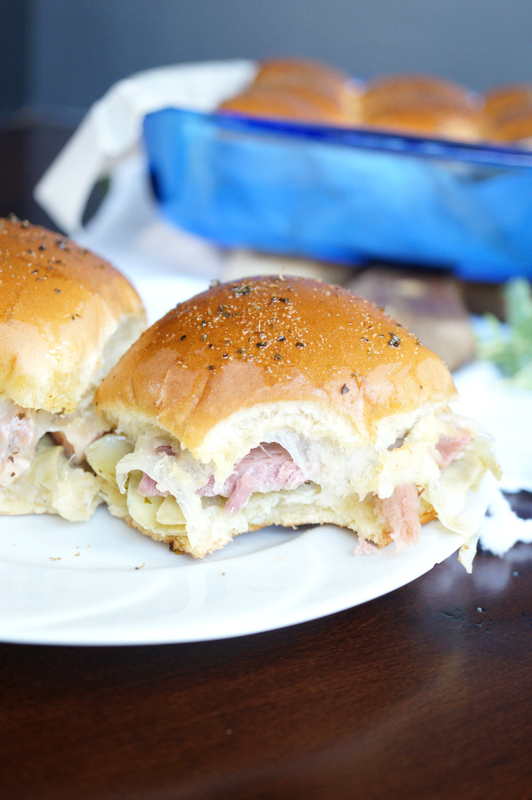 Panini-Style Ham and Cheese Sliders are soft little buns filled with marinated artichokes, ham, provolone, and topped with a delicious mixture of herbs and olive oil. So easy and SO delish! 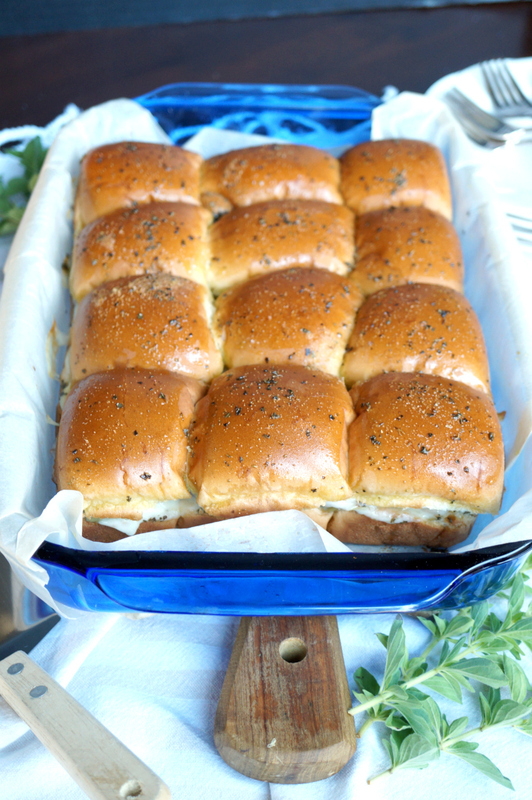 I know you have absolutely seen the infamous ham and cheese sliders on Pinterest, the ones with the poppyseed dressing…. I thought those would be a great way to use up Easter ham, BUT of course I had to give them a twist! I decided to call these panini-style sliders because we Italians classically put marinated and pickled veggies in our panini. Artichokes are the go-to in my house, but in Italy, you can actually buy a marinated mix of finely chopped veggies especially made for sandwiches which is SO delicious. I decided to just use that as inspiration and add a little tang to these sliders! Believe me when I say this is probably one of the all-time EASIEST recipes to ever be featured on this blog! It took me less than 10 minutes to put together, and it takes just about 15 minutes in the oven. Dinner on the table in less than 30 minutes and with just a handful of ingredients? I think yes! 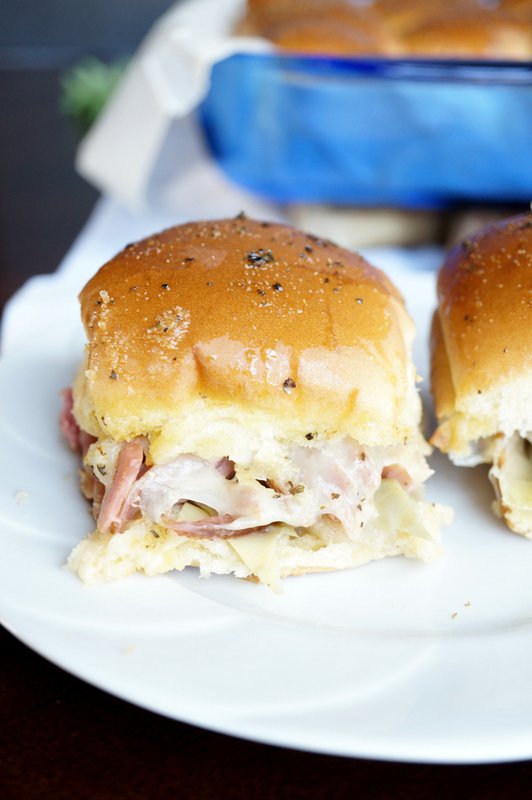 Of course, I whipped up these ham and cheese sliders as a way to use up Easter ham, but of course you can use deli meat in a pinch. I think turkey would be delicious in here! 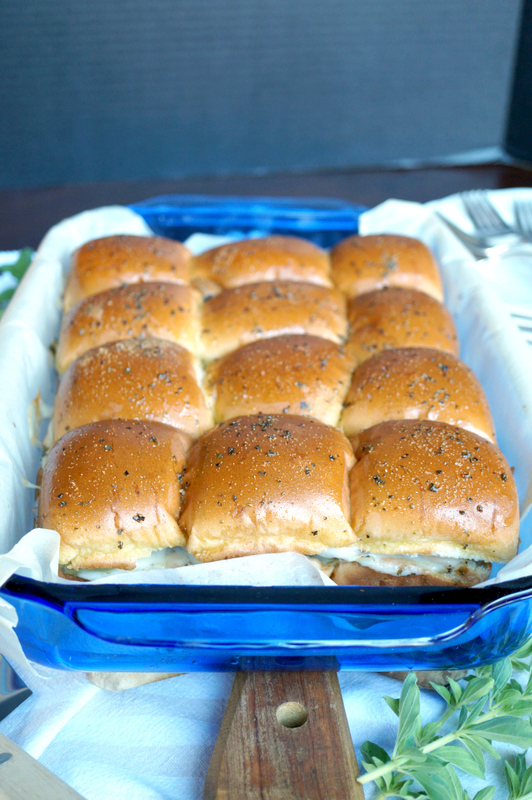 I hope these cute little buns make an appearance at your dinner table soon! They’re the perfect fast, easy, crowd pleasing meal. Happy cooking! 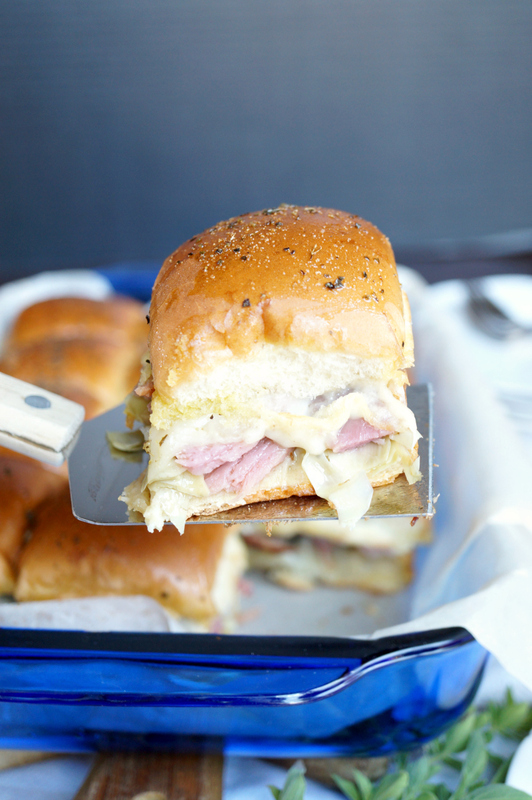 Wanting to use up your leftover ham in a different way? Make my Pasta al Forno! Grab a 9x13 pan, and line with parchment paper if desired. Cut the buns in half, and arrange the bottom half inside the pan. Cut the artichokes into thin slices, and lay them on the bread. You can spoon on a little bit of the marinade as well! Top with the ham and then the cheese slices. Place the top of the buns on top of the sandwiches. In a small bowl, mix together the olive oil, oregano, garlic, onion, and salt for the topping, and spoon it on top of the bread. Cover pan with foil, and bake for 12-15 minutes, until cheese is melted and sandwiches are hot. Uncover, and bake for 2-3 minutes more. Serve immediately!